You are a thief who has traveled to Castle of Fire to achieve where many Knights have failed; To steal those evil dragons' treasures! How high of a score can you get? Castle of Fire is a tribute to the ATARI 2600 game, Dragonfire. 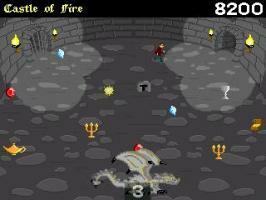 The object of the game is to dodge deadly fireballs on castle bridges and enter dungeons to steal as many treasures as you can. "An excellent homage to an Atari classic. Run through a castle dodging deadly fireballs and jumping over pits. The difficulty is extremely high and the controls a little awkward, but with patience you can master the game and find yourself on the high score board. The graphics are perfectly suited to the game and the sound and music are excellent. The added practice mode is a very nice touch. A few minor bugs and collision issues, combined with the previously mentioned awkward controls and high degree of difficulty can lead to frustration. Overall, however this is an very good example of AGS' flexibility. Recommended to players looking for a bit of twitch gameplay with a high difficulty." This is a real 'Gem' of a game I have stumbled across. Dodge fireballs to get to a dungeon, where each dungeon is a different challenge. You'll most likely come across a dragon, but there are also 'baddies' like fireflies, spikes that go up and down, and more that I won't reveal. There is also a practice mode, and if you get all the gold stars in the practice, a bonus game will open up for you. More of an arcade game than an adventure game, and if you in the mood for an arcade game, give it a go!